Objects in a directory can be accessed either by path or by objectIdentifier. ObjectIdentifier – Every object in the directory has a unique global identifier, which is the ObjectIdentifier. ObjectIdentifier is returned as part of the CreateObject API call. You can also fetch the ObjectIdentifier by using GetObjectInformation API call. For example, to fetch the object identifier of object 005, you can call GetObjectInformation with object reference as the path that leads to the object, which is group/b/e or group/a/d. A leaf node object cannot have children. A node object can have multiple children. An object of the policy type cannot have children and can have zero or one parent. Use the UpdateObjectAttributes operation to update individual facet attributes on an object. Use the AddFacetToObject operation to add new facets to an object. Use the RemoveFacetFromObject operation to delete existing facets from an object. You must detach the object from the tree. You can detach an object only when it doesn’t have any children. If the object has children, you must detach all the children first. You can delete a detached object only if all the attributes on that object are deleted. You can delete attributes on an object by deleting each facet attached to that object. You can fetch a list of facets attached to an object by calling GetObjectInformation. An object must also have no parent, no policy attachments, and no index attachments. Because an object must be fully detached from the tree to be deleted, you must use the object identifier to delete it. This section discusses various elements relevant for querying objects in a directory. Because Cloud Directory is a tree, you can query objects from the top down using the ListObjectChildren API operation or from the bottom up using the ListObjectParents API operation. Given an object reference, the LookupPolicy API operation returns all the policies that are attached along its path (or paths) to the root in a top-down fashion. Any of the paths that are not leading up to the root are ignored. All policy type objects are returned. If the object is a leaf node, it can have multiple paths to the root. This call returns only one path for each call. To fetch additional paths, use the pagination token. FIRST - Starts from the first indexed attribute value. The start attribute value is optional. LAST - Returns attribute values up to the end of the index, including the missing values. The end attribute value is optional. LAST_BEFORE_MISSING_VALUES - Returns attribute values up to the end of index, excluding missing values. INCLUSIVE - Includes the attribute value being specified. EXCLUSIVE - Excludes the attribute value being specified. Using the ListObjectParentPaths API call, you can retrieve all available parent paths for any type of object (node, leaf node, policy node, index node). This API operation can be helpful when you need to evaluate all parents for an object. The call returns all the objects from the directory root until the requested object. It also returns the number of paths based on user-defined MaxResults, in case of multiple paths to the parent. The order of the paths and nodes returned is consistent among multiple API calls unless the objects are deleted or moved. Paths not leading to the directory root are ignored from the target object. For an example on how this works, let's say a directory has an object hierarchy similar to the illustration shown below. The numbered shapes represent the different objects. The number of arrows between that object and the directory root (000) represent the complete path and would be expressed in the output. The following table shows requests and responses from queries made to specific leaf node objects in the hierarchy. In this example, object 005 has both nodes 002 and 003 as parents. Also, since MaxResults is 2, both paths display objects in a list. 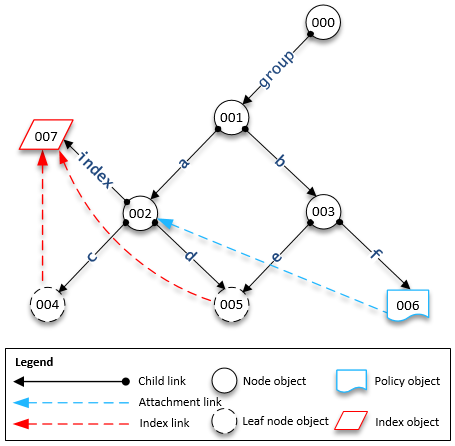 In this example, object 005 has both nodes 002 and 003 as parents. Also, since MaxResults is 1, multiple paginated calls with page tokens will be made to get all paths with a list of objects.